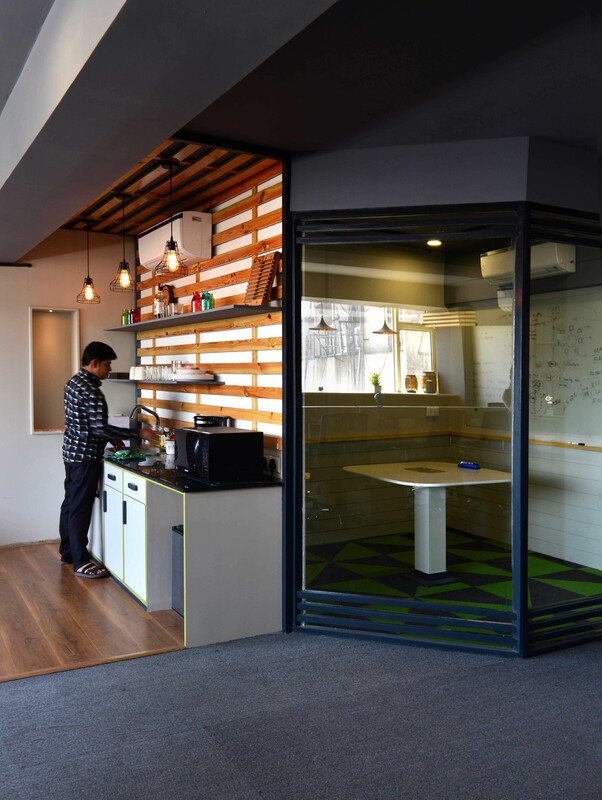 Grey Office at New Delhi by Orangewood Labs - ArchitectureLive! “The Grey Office” which has an experimental and unique sense of design in the way it has been developed. The 1800 sq.ft. office is designed with taking utmost care to the personal taste and way of work environment they believe. 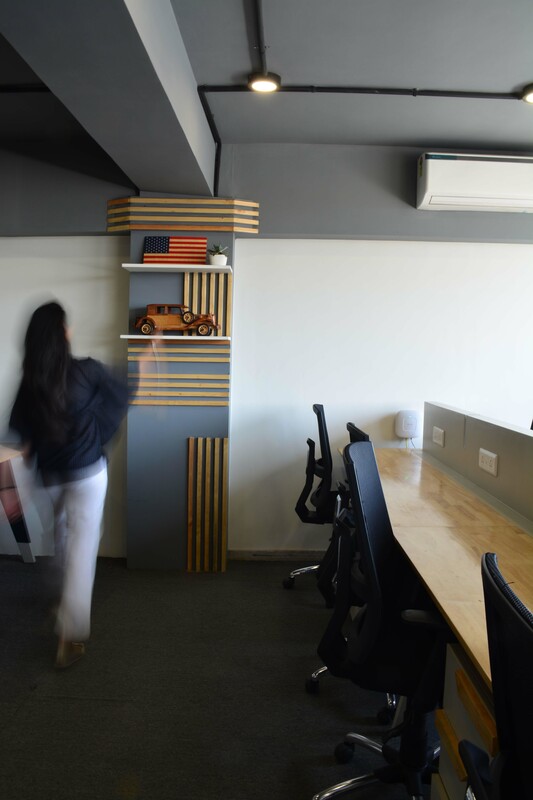 “GREY OFFICE”, is a office for US- based IoT company (Internet of Things) who wanted to expand in India with a new setup located in New Delhi showcasing simple yet bold reflections of the company principles. 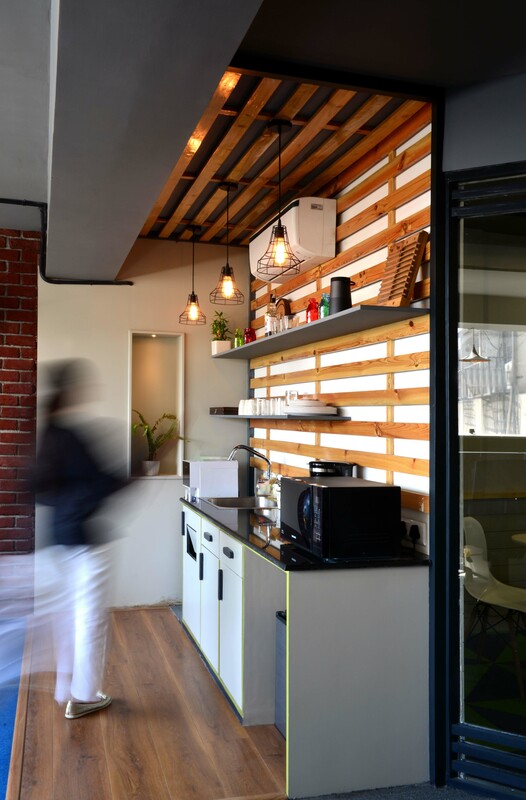 With client’s love for raw and industrial setting, this office space is conceptualized to bring out new thinking by creating industrial elements in a controlled way and using them with the bright and bold elements, creating a raw and refreshing office for people working in there. The spaces are incorporated with simple and minimal detailing, seeking humble materials, sticking with cool colors and letting the natural light penetrate. 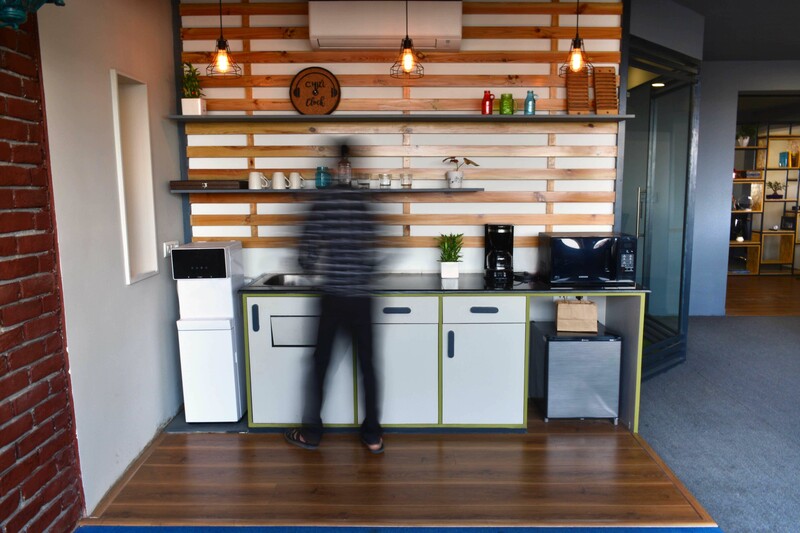 The interactive focus point created as a breakout space provides visual connection, relaxation and wellness at workplace. Textures and Furniture pieces expresses bold statement. The overall office theme exhibits tranquility and balance. 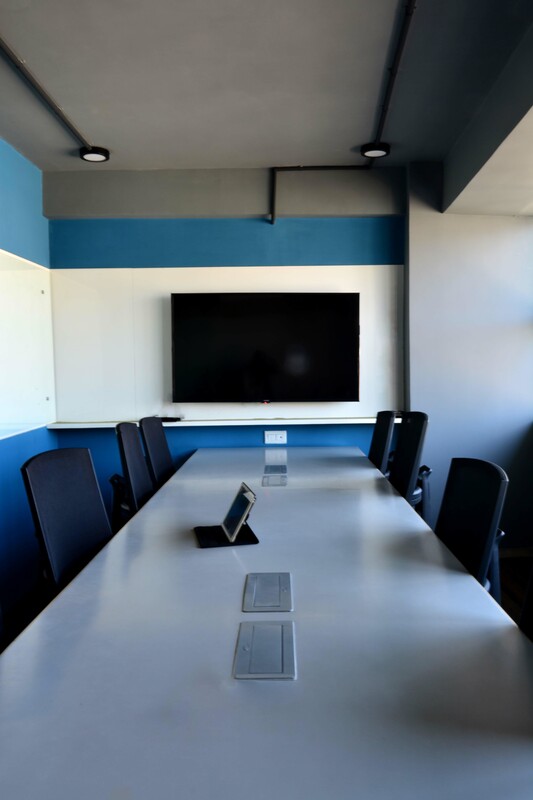 it’s no secret that office design can either enhance or dampen the company culture. The roots of the firm is reflected through its brand, functions and values. 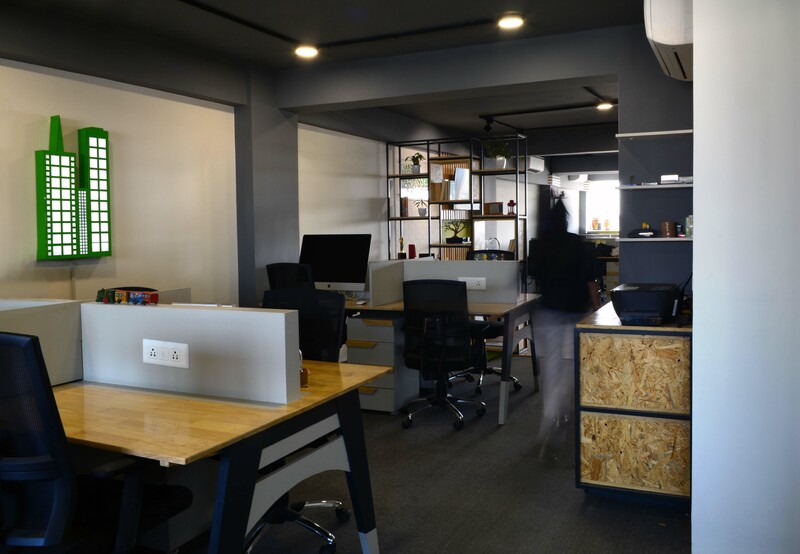 Our client – ‘SENRA’, a U.S based IoT (Internet of things) company, had a similar approach while expanding and setting up of their new office in India. Thus, they wanted to create an environment that could define themselves and their business venture. 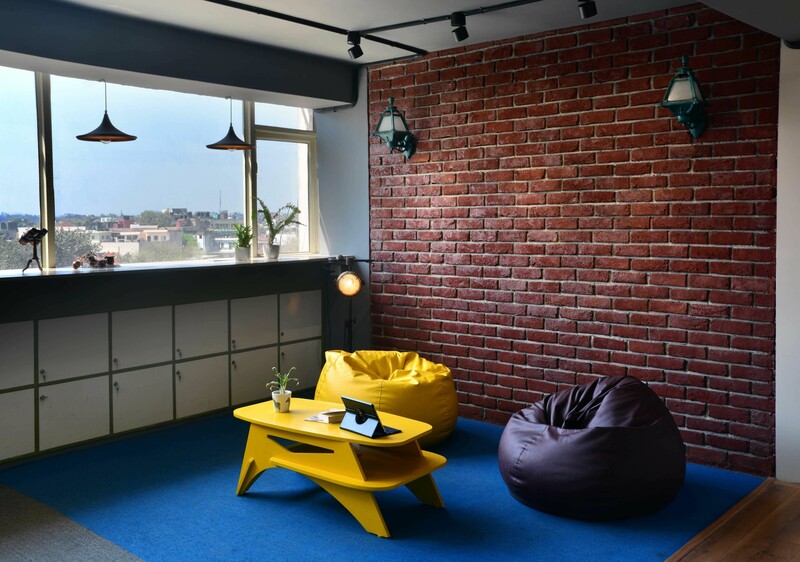 The 1800 sq.ft office, located in New Delhi, includes an entrance lounge, a breakout space connected with an open pantry, 20 open workstations, 1 conference and 2 meeting rooms. 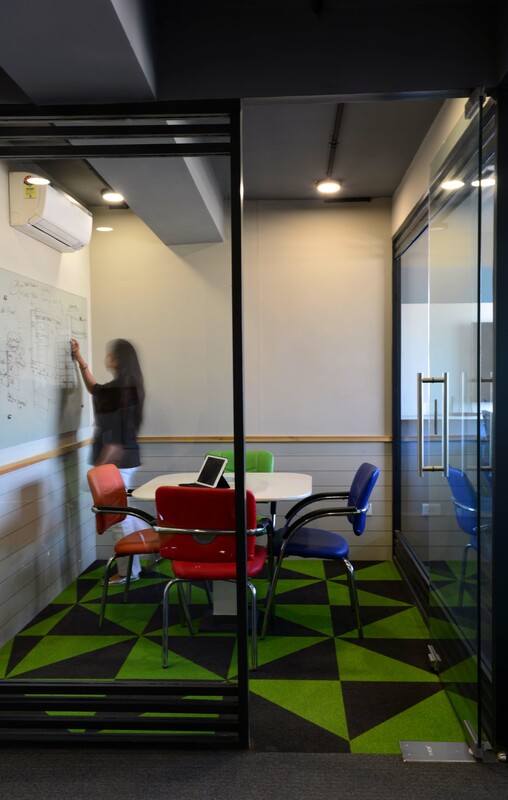 The office is designed on the concept of contemporary and industrial interiors, as per client’s choice to create a minimal, raw and rejuvenating environment. The spaces are incorporated with open planning, simple and minimal detailing, seeking humble materials, sticking with cool colors and letting the natural light in. Thereby, executing a combination of practicality and creativity. For a raw and rustic feel, we picked cool shades of gray for the overall interiors and merged them with splashes of sophisticated blue, yellow and green. 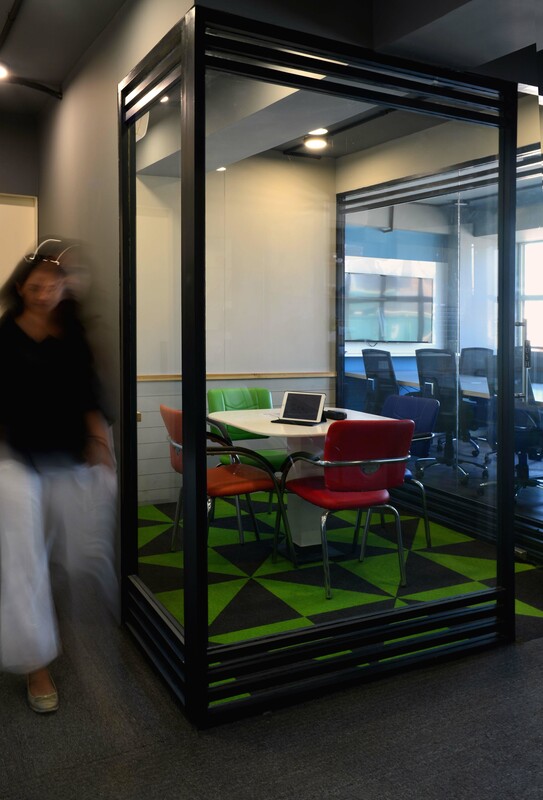 In-terms of layout, the office is divided into three zones, where the entrance lounge acts as the central zone segregating the working areas into two zones. The idea of the client, to educate the visitors about their venture once they enter, is conceptualized by providing museum-like-feel through a shelf where products developed by the company can be showcased in the entrance lounge area like of a museum with a display panel at the entrance lounge for presentations, followed by a semi-open partition designed in M.S and chip board, to display artifacts and thereby enhancing the aesthetics. Another thought was to capture the maximum day light penetrating through the two openings on the site. The interactive focus point created as a breakout space provides visual transparency, interactive connection, relaxation and wellness at the workplace. 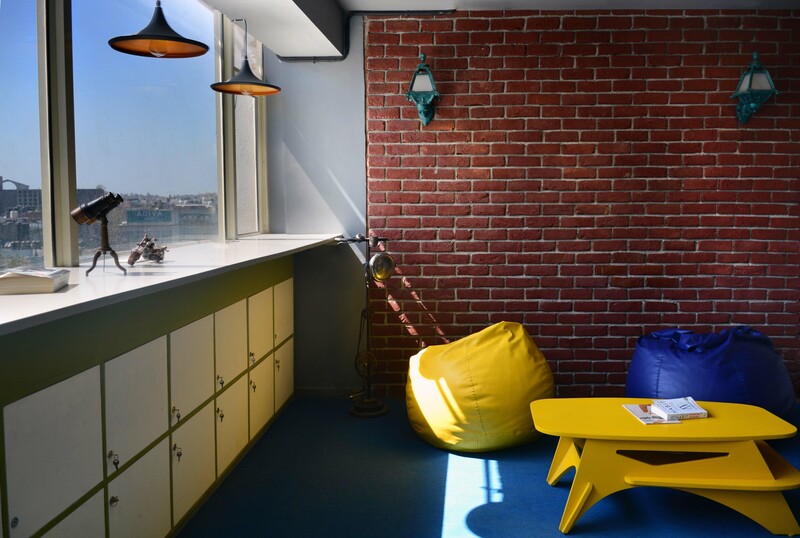 In such working environment one might require a small refreshing spaces to grab a cup of coffee and for casual meetings. So idea of a breakout space came in to picture connected with open pantry. 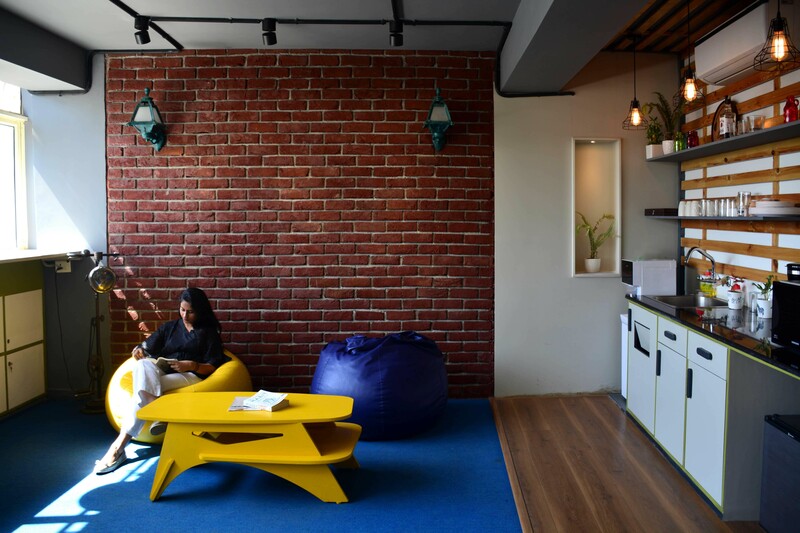 And we used the carpet in blue color, in contrast with the grey scheme, very striking element in the space, with backdrop of real raw bricks which adds the raw character into the space. Use of exposed brick wall as a backdrop, adds the industrial and refreshing character to the space. Textures and furniture pieces expresses bold statement. The white and gray color theme portrays a sense of calm and composure, which when used in gray ceiling and carpets, infused with M.S. frame cabins and solid rubber wood furniture, creates a neat and balanced look. The overall office theme exhibits tranquility and harmony. 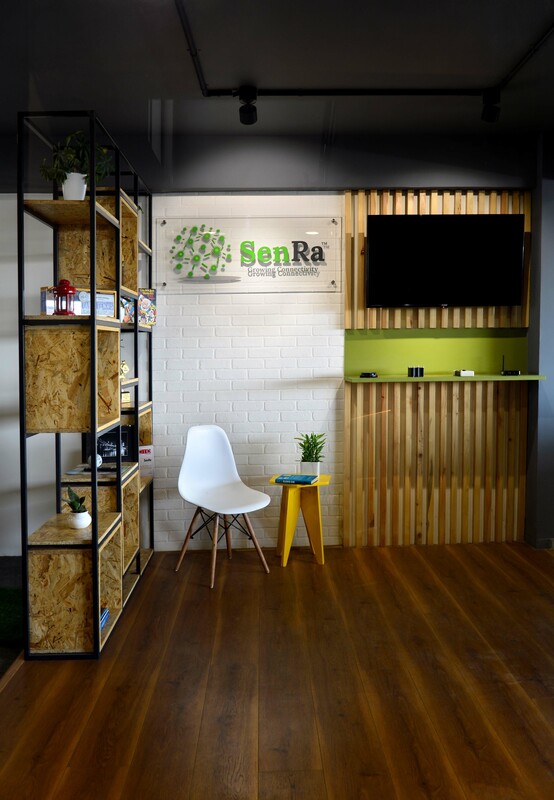 Client – Senra Tech pvt. Ltd.